Even a small gap above your door can lead to major heat loss during the colder months, not to mention the entry of insects and the exit of air-conditioned air in the summer. Your energy savings makes the repair worth the effort, and there are several easy ways to fix door gaps. If you notice the gap above the door during the process of installation, that's the time to fix it. You have all the tools out and the door isn't painted yet, so take the opportunity to repair it right. If the gap is small on the hinge side of the jamb and larger on the knob side, this means you haven't installed the jamb square and that the hinge side is lower than the knob side, causing a wedge-shaped gap over the door. Lower the knob side of the jamb, and shim between the jamb and the rough opening until the gap between the door and the inside of the jamb is about 1/8 inch and consistent. If the gap between the door and the jamb is large and consistent, the door is mounted too low in the jamb. Measure the width of the gap, then remove the door from the jamb and take the hinges off the door. Fill in the notches where the hinges were with thin pieces of wood. Move the hinges down on the door by the width of the gap minus 1/8 inch. If the gap was 3/4 inch, remount the hinges 5/8 inches lower than they were on the door by routing or chiseling out new notches and screwing the hinges into them. Cut a piece of wood that is sized to the gap between the door and the jamb, and nail or screw it to the top of the door. This solution is most appropriate when the gap is very large. 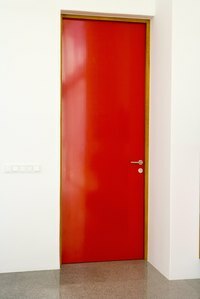 Make the filler piece as inconspicuous as possible by cutting it to the same thickness as the door, putting wood filler into the joint between the door and the filler piece, sanding it smooth, and then painting the door and the filler piece the same color. Leave a 1/8-inch gap between the top of the filler piece and the jamb so the door doesn't stick. A small gap above the door can be filled by weatherstripping, which is flexible and will conform to the gap, filling the space up and preventing air from entering and exiting. Different types of weatherstripping are made from rubber, felt and foam. Some are nailed on, some have adhesive backings and some slide into a notch in the door jamb. Weatherstripping is only appropriate for gaps that are 1/4 inch or less. Should You Caulk Between Stucco & Trim?